Serums have become the new elixir of beauty. Almost every brand has a serum product and they seem to be the staple of many a beauty regime. The semiotics of serums reveals a very skilful blend of semantic, packaging and product formulation codes. Serums tend to retail for over £30 for a tiny bottle, so how do the manufacturers justify the high price point? I would argue that it is a combination of factors. First the semantics of the word serum itself is replete with positive connotations. It is a word that sounds smooth, it is onomatopoeic in the way that vindicates Jacobson’s critique of Saussure’s contention that all language is arbitrary. The sibilant ‘se’ leads into the cossetting cosiness of the ‘rum’, sumptuous to pronounce and to countenance. Secondly, serums play upon the two sides to the beauty industry. On the one hand there is the perpetuation, and petrification of good looks. On the other side there is the fight against the onslaught of attrition, derma-abrasion and of course anno domini too. So the positioning of the serum is essentially Janus faced. It promises to immortalize your beauty via the alchemy of the mythical elixir on the one hand. The clues are in the brand names of Elixir, Immortelle, Forever Young and Ageless. The truth of this proposition is reinforced by the idea of a truth serum, something that forces us to be sincere and the connotative links between beauty and truth traced back to Platonism and notions of Platonic forms – serums, it is insinuated help you access this deep ontology of truth. On the other hand, serums are also a form of vaccine, or an anti-serum used for inoculation. In the case of serums on the market they are inoculating against the disease of decay and entropy. These underlying discourses are reinforced by the packaging codes in the sector. Serum packs tend to emphasize the preciousness and daintiness of the products as beauty unguents but also stress the concentrated nature of the contents, as if nutritional value had been crammed in with geological force. 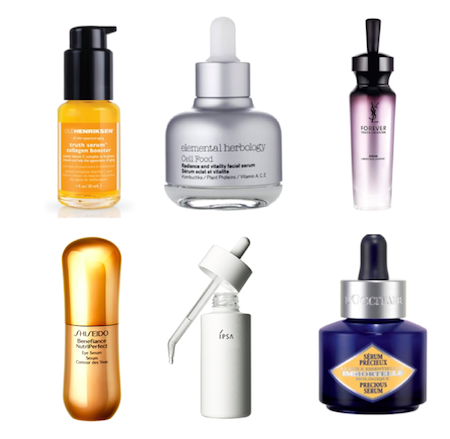 Serums are the royal jelly or caviar of the beauty world and packaging cues this in spades. Analysis of serums packaging is as indebted to design thinking as to semiotic thinking. Serum packs draw upon such tricks as symmetry, golden ratio, contour bias and emotional design in order to attract customers and to buttress the high price point. There is also a subliminal link between miniaturization and premium technological efficiency that is coded through designs. As research pioneer Louis Cheskin discovered, customers tend to transfer the forms and meanings they encounter in packs to expectations of the contents. This is more important as ever more time poor consumers ruthlessly scan shelves for brands that catch their attention.